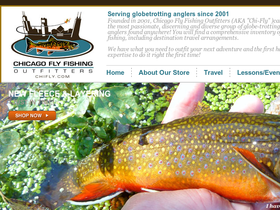 Shop Chicago Fly Fishing Outfitters online at ChiFly.com for all your fly fishing needs. Chicago Fly Fishing Outfitters was founded in 2001, and caters to one of the most passionate, discerning and diverse group of globe-trotting fly anglers found anywhere! At Chicago Fly Fishing Outfitters you will find a comprehensive inventory of everything fly fishing, including destination travel arrangements. Chicago Fly Fishing Outfitters proudly features the following brands: Sage, Winston, Scott Rods, Redington, Temple Fork Outfitters, Echo, Ross, Tibor, Waterworks-Lamson, Abel, Nautilus, Loop, Hardy, Simms, Patagonia, Ibex, Chota, Filson, William Joseph, Fishpond, Action Optics, Kaenon Polarized, Scientific Anglers, Rio, Umpqua, Pacific Fly Group, Whiting, Hareline Dubbin, Wapsi, Dr Slick, Mayfly, Brodin Nets, Tilley Hats, and over 70 other brands. Save on your next purchase from ChiFly.com with Chicago Fly Fishing Outfitters discounts, Chicago Fly Fishing Outfitters coupons, Chicago Fly Fishing promotions and savings from 58coupons.com. Get on over to ChiFly.com to save up to 70% or more on some fantastic closeout items. Hurry, supplies are going fast! ChiFly.com is offering either free shipping or a free gift with purchases totaling $99.95 or more. The free gift has a value of $21.95. Click link to view the gift and details. Hurry classes start soon at Chicago Fly Fishing Outfitters. Click link for details. You don't want to miss this class. Purchase $199.95 or more to receive a free gift (valued at $21.95) and free shipping from Chicago Fly Fishing Outfitters. Click link to see the gift.